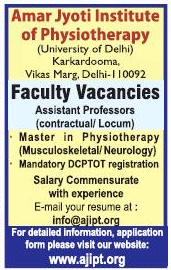 Amar Jyoti Institute of Physiotherapy, Delhi has advertised in Hindustan Times for the recruitment of Assistant Professor jobs vacancies. Interested and eligible job aspirants are requested to apply by earliest. Check out further more details below. About College: The Amar Jyoti Institute of Physiotherapy (affiliated to University of Delhi) conducts a 4 ½ year Bachelor of Physiotherapy program (Inclusive of six month Internship).The curriculum has been developed keeping in mind an ever increasing knowledge base that is anchored in scientific evidence . Teaching at the Institute is problem-based and our highly qualified and clinically oriented faculty uses a variety of contemporary pedagogic strategies that include a judicious mix of didactic and laboratory based instructional technique.